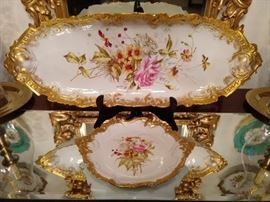 Vintage gilt wood, beveled glass mirror, set/4, hand painted French Limoges porcelain plates, huge hand painted French Limoges fish platter, with three matching serving plates. Detail of the huge French Limoges fish platter. 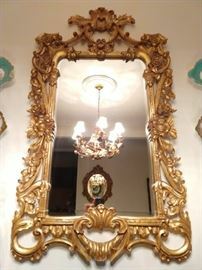 Beautifully detailed gilt wood wall mirror, with beveled glass. 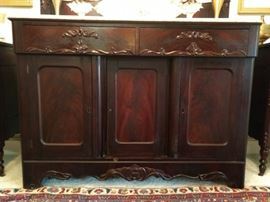 Wonderful Victorian mahogany sideboard, with white marble top, carved backsplash, two drawers and three doors. 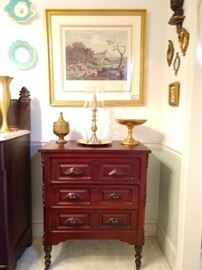 One of a pair of antique 3-drawer mahogany chests, from the estate of the late Katherine Hardy, one of Marietta's first female lawyers. 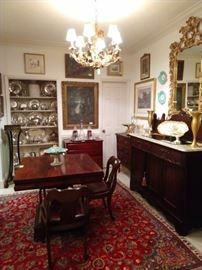 Antique American Empire mahogany entry/dining table, from Fenwick Hall Plantation, Charleston SC, set /4 American Empire dining chairs, with leather upholstered seats. Detail of the pedestal on the American Empire entry table. 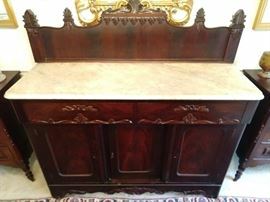 Beautifully veneered mahogany top of the table. Nicely framed/filleted/matted hand colored lithograph of Swiss Lake Geneva. Nicely framed/filleted/matted hand colored lithograph of Swiss Lausanne. 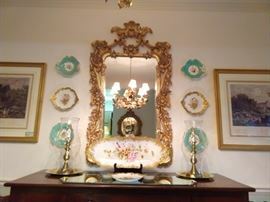 H U G E antique gilt wood mirror, from the Glover family estate, the pink, Italianate stucco home at 81 Whitlock Avenue. This mirror was hung above the fireplace, with 16' ceilings; it measures 8' 8" tall x 4' 7" wide. Detail at the top of the huge gilt wood mirror. Closer still - be still! Mid-Century modern metallic wall art. Vintage hand woven Persian Meshad rug, 100% wool face, measures 9' x 8'. Several sets of vintage stemware. TON'S of good silverplated holloware. 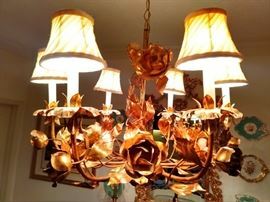 American & English silverplated holloware. Yep, MORE good silverplated holloware. One of a pair of good Frenchy loveseats, with down cushions. 1960s Frenchy natural wood coffee table. Here's its twin sister. I didn't turn it over to look, it might be the brother, maybe even transgender - who knows?!? 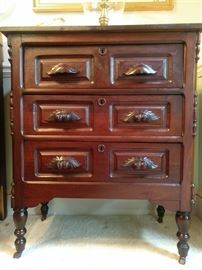 One of a pair of beautiful, vintage mahogany drum tables with two drawers and tooled leather tops, with protective glass. Greek key tooled leather border on the tops of the pair of mahogany drum tables. 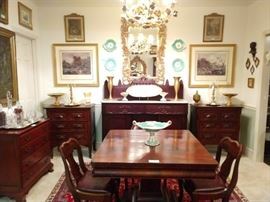 64-piece set of Warwick china, made in California. Warwick china was made in Wheeling, West Virginia, in a pottery factory, active from 1887 to 1951. 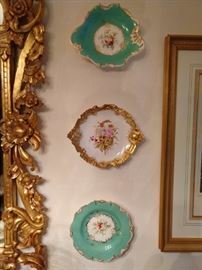 46-piece set of Flintridge china, made in California. Flintridge China Company was founded in 1946 in Pasadena, California. Flintridge took its name from two materials necessary for making china: "flint" and "kaolin." Kaolin is a Chinese word meaning "high hill" or "ridge" where the finest clay is made. 70-piece set of Minton "Golden Fern" china; 1946-1959. 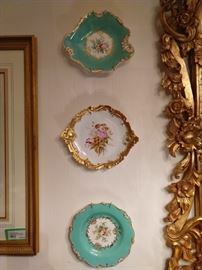 Minton China was established by Thomas Minton in Stoke-upon-Trent, Staffordshire, England in 1793. In its first years, Minton produced earthenware, a low-fired pottery that is permeable to water. Shortly thereafter, Minton formed a partnership with Joseph Poulson who created bone china.